Get Clean. Stay Clean. : Passive Suicide? Suicide is no laughing matter. However, we often laugh at what we don't understand or what frightens us. Cartoonist Andy Riley capitalized on this phenomenon when he created The Bunny Suicide Calendar which depicts twelve months worth of cartoon bunny's trying elaborate ways to end their lives. 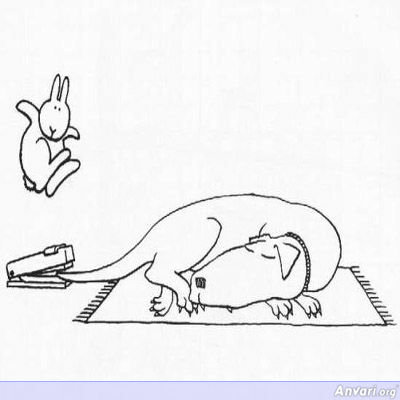 As we can see in one of Riley's cartoons above, the bunny is actively participating in his suicide plan while the passive dog is about to wake up in a stapled tail rage! Sick? Probably. Twisted? I think so. Lucrative? You bet! Hilarious? Come on, admit it, you snickered when you saw it! On a more serious note, when Ben told me he’d been clean for a year, I asked him what was the biggest difference in his life now compared to a year ago. He described the life of an ex-girlfriend who is currently still using to illustrate his answer and how he existed a short year ago. Wow. This poor girl was committing passive suicide. She was not willing to get help. Maybe you feel the same way. Let me tell you if you can access that small flame inside that wants to quit, that little spark within you, is the first sign of hope. Suicide can only work if you participate. Please do not participate actively or passively! You are worth so much more than suicide can ever offer you. We see it every day. Again and again and again as we help people safely and comfortably detox from alcohol, opiates, and benzodiazepines. Stopping the opiates is the first step. That’s where The Coleman Institute can help!